Beyond Bacon – A Book Review. We meet Stacy Toth and Mathew McCarry about a year and a half ago and were immediately impressed. We fell in love with their children’s book called Eat Like A Dinosaur, and we quickly bought the book to give to our family members with young children. (we tried a few recipes too!) So we were beyond excited when we found out that Stacy and Matt had written a book for adults – and what a book it is. 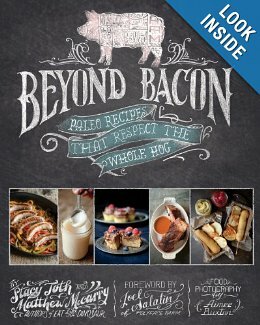 Beyond Bacon is a wonderful journey into the world of pork. As connoisseurs of nearly every major meat source from Antelope to Zebra, pork holds a special place in our hearts as one of the most succulent and truly luxurious meats in the world. Given a choice between a New York strip or a double cut, acorn fed pork chop, we are going to chose the pork chop every time. Or how about a piece of grouper or a, hot off the fire, rack of baby back ribs? Ribs please. Stacy and Matt, the brains behind Beyond Bacon have successful written the definitive guide to mastering whole hog purchasing and preparation. The book starts with giving you a few points to consider when ordering your first hog. Like how much do you want? A whole hog, a half hog or do you want to split a hog with 3 or 4 friends. Next they give you a sample cut sheet. Yep, your new friend the butcher will be asking you all kinds of questions you are going to want to know the answers too, such as – what size do you want the roast? And what kind of sausage would you like, links or patties? Do you want them extra spicy? (we do!) Preparing your answers before you get on the phone will make you look like a real pro. Then it’s off to the cooking potion of the book starting on page 62 with rendering your own lard, a fantastic cooking tool, and a source of vitamin D.
Beyond Bacon is full of rich, vivid photographs of some of the most mouthwatering food we have ever seen. From Huntsman Stew (page 120) to Curried Cracklin’s (our personal favorite – page 192) if you like pork you are going to love this book! There are some recipes that call for sugar, a no, no in our Rich Food philosophy, but as Stacy and Matt point out you could use a palm/coconut sugar instead or you can do what we do just add a little stevia*. Enjoy!